I've been meaning to write a post about the recent birthday celebration and share pictures. It was super fun. The chosen theme, as I mentioned before, was a detective party. For the annual birthday outfit, I made a detective cloak of gray and black hounds tooth check that is lined with some adorable, tiny pink floral cotton and trimmed it all with black bias tape. I also made a matching a-line skirt, which was also trimmed with black bias tape. I found the pattern for the cloak over at Martha Stewart. Really, though, I only used the pattern for the collar. I kinda just winged it with the skirt and thankfully it fit just right. I made the cake per request. Thankfully the birthday girl knew exactly what she wanted...a magnifying glass. No problem. She still wanted the final product to be a surprise so I made it after she went to bed. It's not my best cake work, but she was thrilled and that's really all that mattered. There were many wonderful detective themed gifts. She also received some adorable clothes and toys and girly lip gloss. Besides wearing her cloak often, the gift that has gotten the most use is Scrabble Flash. Everyone that enters the house can't help but play it for a few minutes. If you love playing regular Scrabble, you'll love Scrabble Flash. Seriously. Oh, her most favorite gift, much to the cat's dismay, was a cat training kit. Oh yes, she's been training the cat. Although, as time goes by and I hear the excitement about him learning new things and being rewarded with treats, it occurred to me that our little fur ball is quite clever as it seems, from where I'm sitting at least, that he is the one training her to give him more and more treats. Either way, they're both happy. Also, to make the day even better, my mom, my sister, and my niece all came to the party as well. It was really fun to have them here. So there you have it. 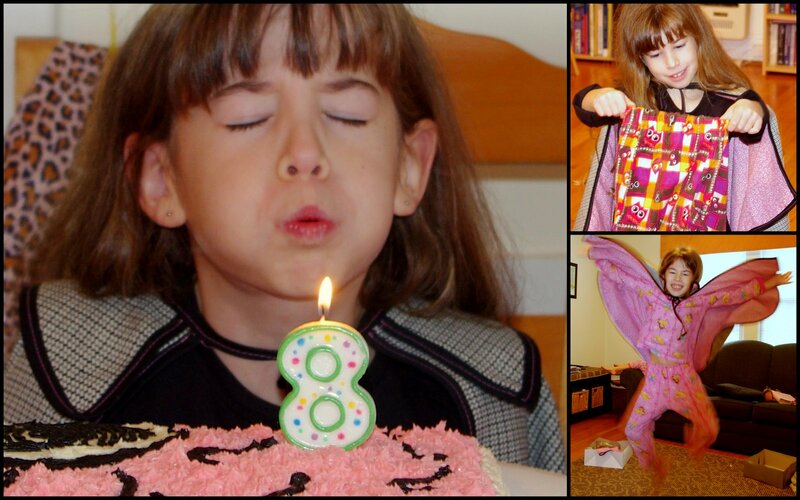 Finally, some photographic proof that someone special in the Clothesline house turned 8 years old! The detective cape looks great! Love it!